Please join us tonight for a celebration to honor guitarist Dale Miller, who recently passed away. 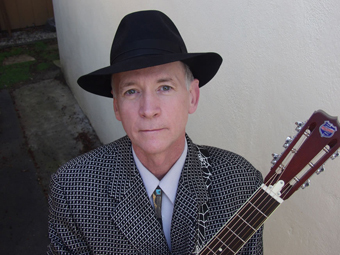 Dale was one of the Bay Area’s most respected fingerstyle guitarists, known for his ability to coax a sweet and mellow tone from his resonator guitars, a custom Martin and a vintage National steel-body, while playing blues, ragtime, jazz standards, and his original compositions. Dale became an established acoustic music star with his mid-1970’s release, Fingerpicking Rags and Other Delights. This highly influential album has inspired several generations of fingerstyle guitarists. His enthusiasm for music was seemingly boundless. Says Acoustic Guitar contributer Teja Gerken, “Not only was Dale incredibly supportive at a time when I was just starting out performing and recording my own music, he had a unique kind of enthusiasm about the projects he tackled himself.” In concert, he was as likely to cover a Bob Dylan tune as he was to do a country-blues interpretation of an Italian opera classic. Guitar masters Teja Gerken, Alex de Grassi, Peppino D’Agostino, Eric Schoenberg, Pete Madsen, Marc Silber, Steve Stein, Doug Roomian, and Solid Air, gather tonight on the Freight stage to pay tribute to Dale and his musical legacy.